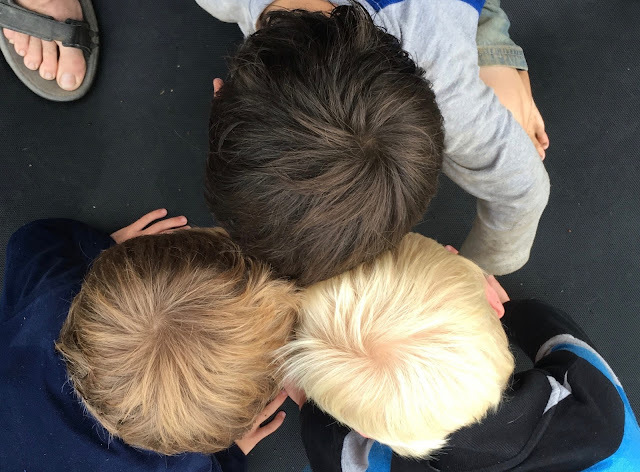 I (Gavin) have often told people that our three younger boys are distinguishable by the color of their hair: chocolate (Will), vanilla (Seth), and caramel (David). This picture shows it well. It's been a busy last few weeks in my (Gavin) work world. The post title pretty much sums it up. The month of March started with a helicopter crocodile survey out in the swampy Sepik River area of northwest PNG. When not flying for missionaries and their co-workers, we often do jobs for commercial companies. The profits from such work goes back into our work of Bible translation, literacy, Scripture use, discipleship, etc. The crocodile survey is one of those jobs. There are some companies that buy crocodile eggs from the swamp areas and hatch raise them at the "crocodile farm", where they eventually export the skins and sell the meat. In order to maintain their export license they need to do regular surveys that show that the wild crocodile population is healthy and not being destroyed. Local people in these crocodile areas make their living off of finding and selling crocodile eggs. 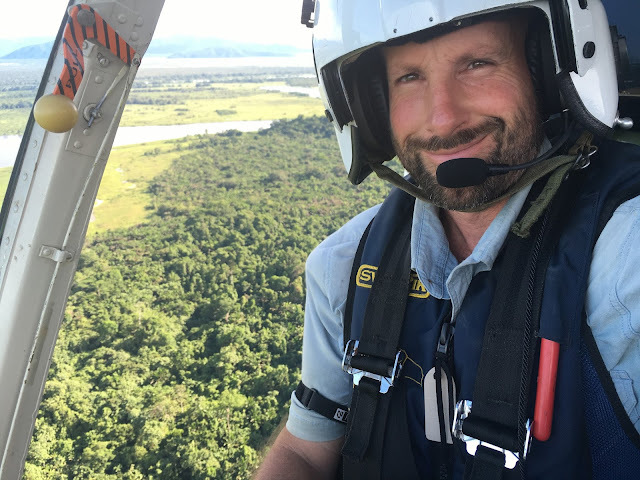 The part that I play in it is flying the nest spotters around the swamplands at low level searching for crocodile nests. Even though I was able to see a bunch of the crocodile nests, I only ended up seeing one crocodile. There are a lot of them around, but we rarely got to see from the air, even when low or in a hover. 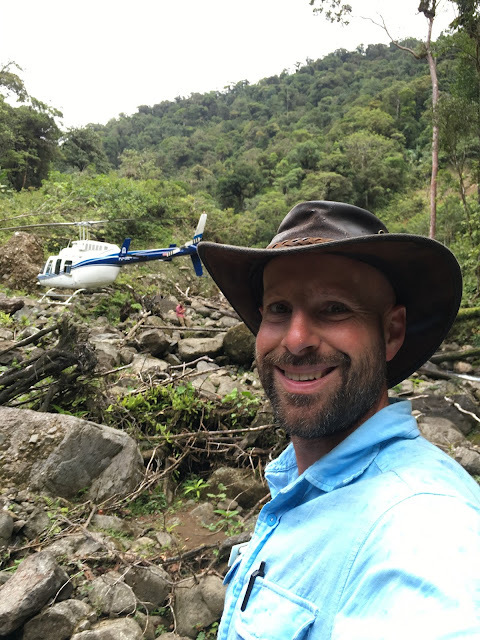 The video clip below shows a bit of what the flying is like (but unfortunately doesn't show any nests or crocs- I was too busy flying to take pictures of them). 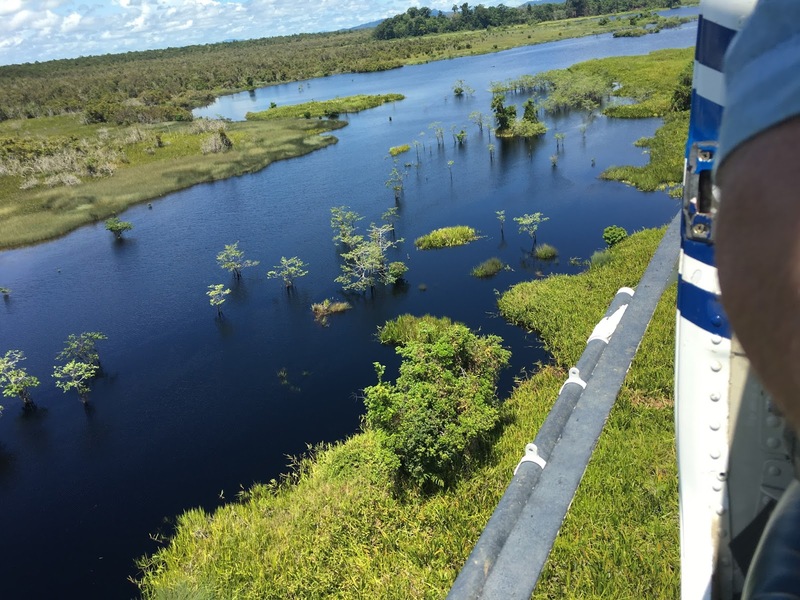 One of the swamps and by waters of the Sepik River plain. Crocodile country! Yes, occasionally there was time for a selfie! There is quite a large population of both saltwater and freshwater crocodiles in PNG, each with their own nesting season. This particular survey was looking for the larger saltwater crocodile nests. Each nest holds around 60-120 eggs! The eggs have an outer and inner shell and are much hardier than a chicken egg. 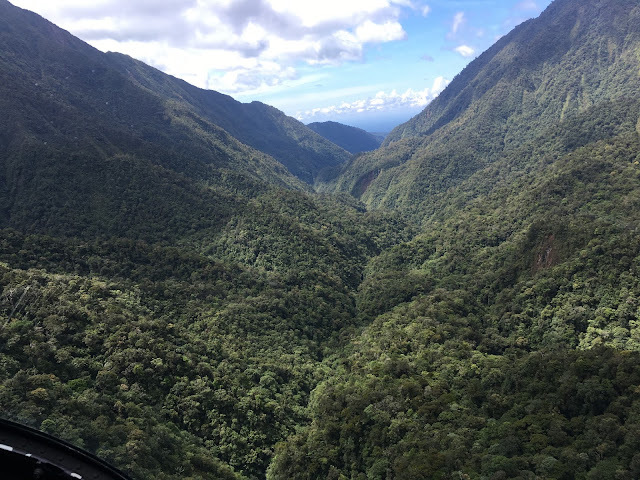 You may have heard that several weeks ago that there was a 7.5 magnitude earthquake in the Southern Highlands of PNG, about 200 miles to the west of where we live. We sure felt the shake - stronger than any we've ever felt here - but the people located in the areas near the epicenter did not fare nearly as well. While the area most affected was in a very remote and rugged part of the country, there were still many villages, gardens, and towns that sustained damage, including quite a few deaths. 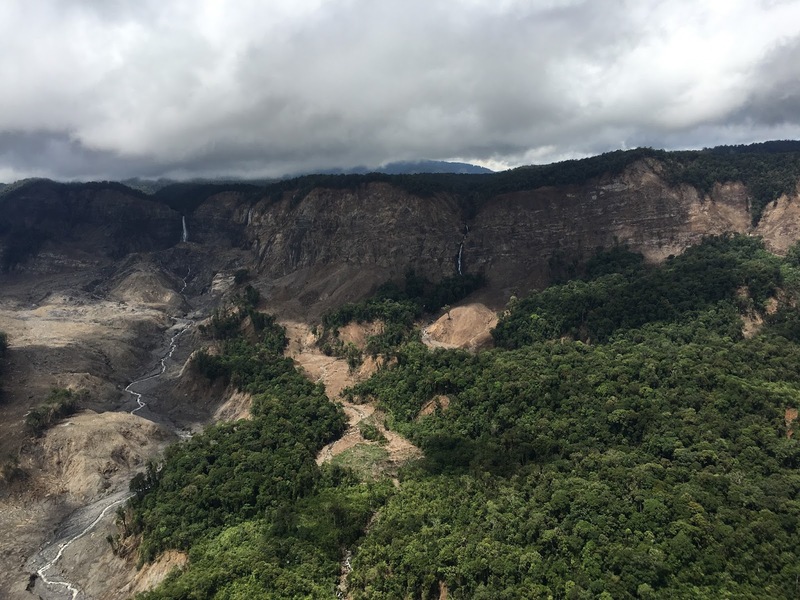 Literally thousands of landslides resulted from the quake and as heavy rains fall, the ground in many areas keeps breaking away and washing more mud and silt into the rivers that locals rely on as their primary water source. 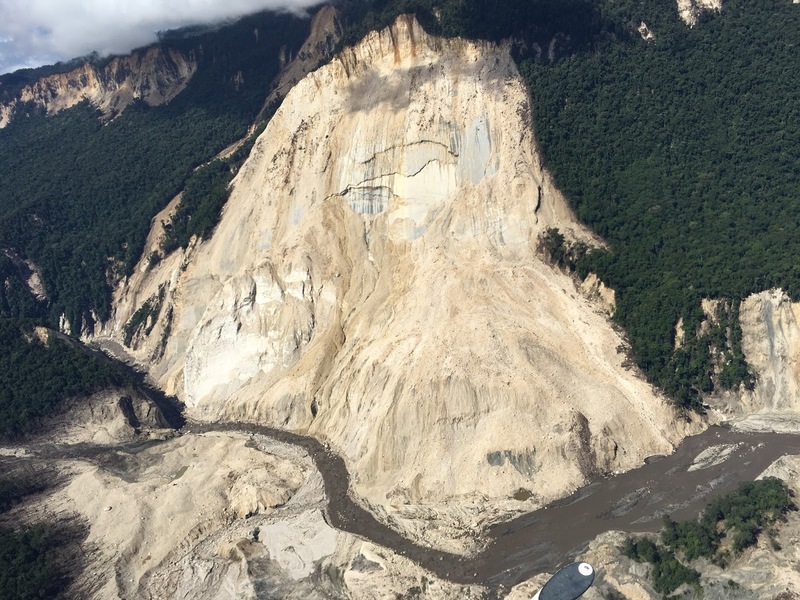 This river was blocked up completely by the landslide, but eventually eroded through. The green you see on the left and right is what all of these areas looked like before the quake. The waterfall on the left used to look totally different, with two steps to the fall. After the quake, a slide up the stream cut it off completely for several days, then it broke through as just one waterfall, since the whole cliff face had fallen away. Closer up to the same waterfall. You can see that the trees come to the very edge of the cliff, because this all used to be solid jungle! This is a view of the waterfall in the previous picture from right above it. 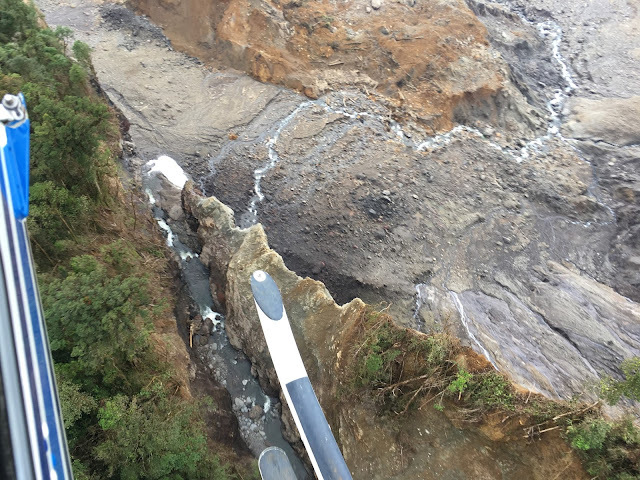 You can see how the cliff completely broke away. 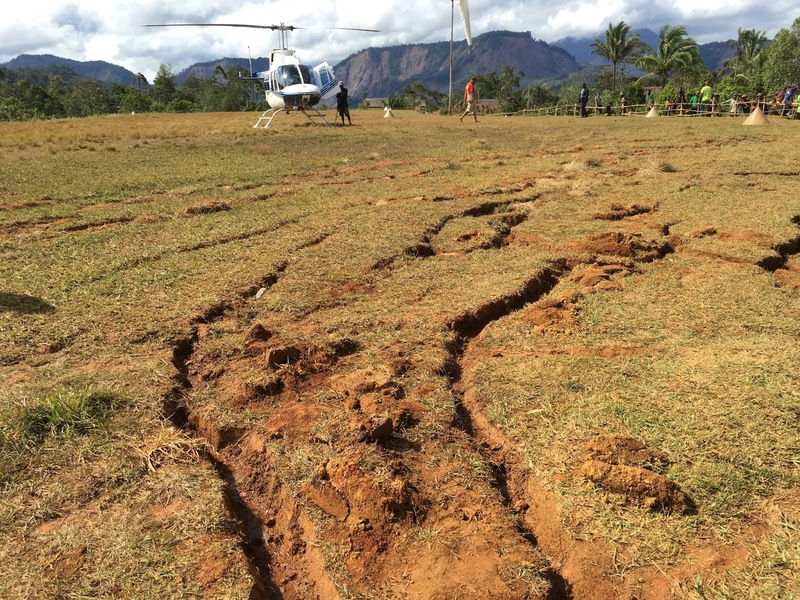 Some cracks from the earthquake on the side of Huya airstrip. you can see the landslides in the distance. Since the initial quake, there have been dozens more smaller tremors as well as a 6.0 and 6.7 magnitude quakes, all in the same area further rattling the ground. While hundreds of people have been displaced, having lost their houses and gardens (the source of the large majority of their food) to landslides, one of the biggest things that has affected them is fear. 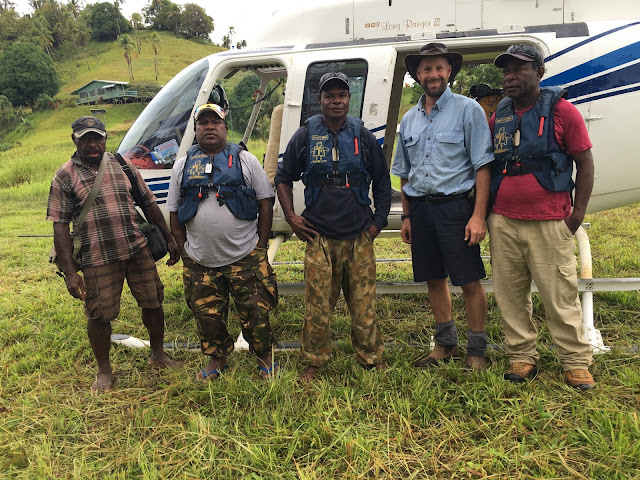 Even though earthquakes of this magnitude are not uncommon in the Pacific Ring of Fire, where PNG is located, the local people have never experienced anything like it in their lifetimes. This lack of experience is combined with low education levels and spiritual beliefs that are inextricably intertwined with the physical world. It is no wonder that the people are scared. Over the last few weeks, our Aviation team has worked with many other mission organizations and relief organizations to deliver supplies to the people in the hard-hit areas. 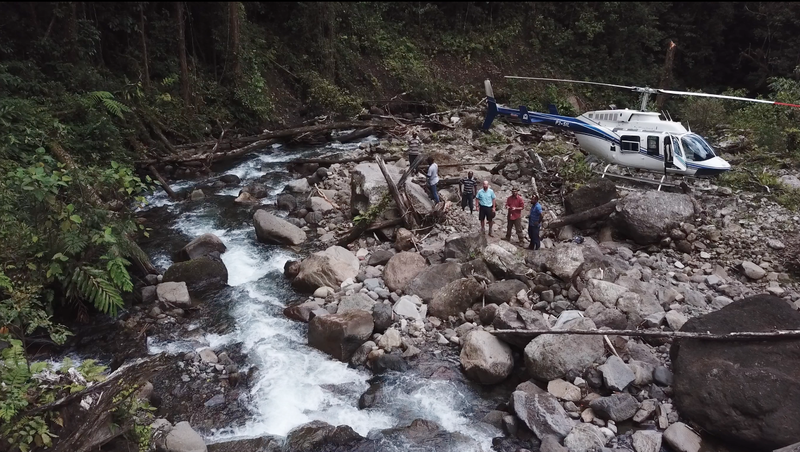 For the last week, our helicopter has been moving rice, flour, canned goods, water tanks, tents, tarps, shovels, axes, nails, and other supplies to the care centers and other needy villages. It has been a joy to help the people in need while very sobering to see the scars all over the land. 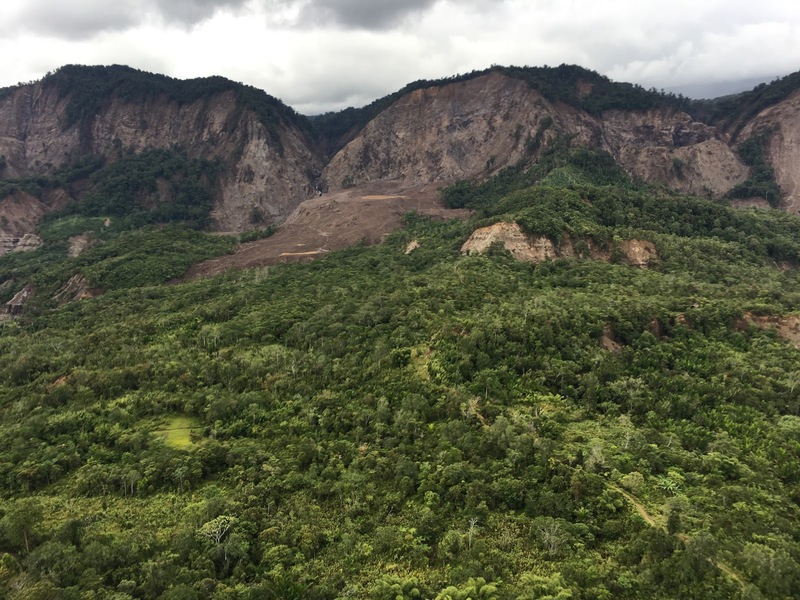 Throughout the stricken area the previously jungle-covered mountains have been clawed to bare earth and stone by some invisible giant beast. Miles of ridge lines thousands of feet high have been transformed from verdant green growth to white, grey, and brown earth. One rumor has spread far and wide since the earthquake hit. There has been talk that Mount Bosavi, a massive, extinct volcano not far from the epicenter has awoken. People are saying that it is erupting now and that lava is flowing and covering up villages and causing the earthquakes. While this information is FAR from accurate, trying to prove it to people is quite challenging. A few days ago, in an attempt to quell the tide of rumors, we flew to Mount Bosavi in the helicopter. A few men from a local village came along, a few representatives from the local Member of Parliament's office, and one of the main coordinators of the relief efforts. The flight was incredible. 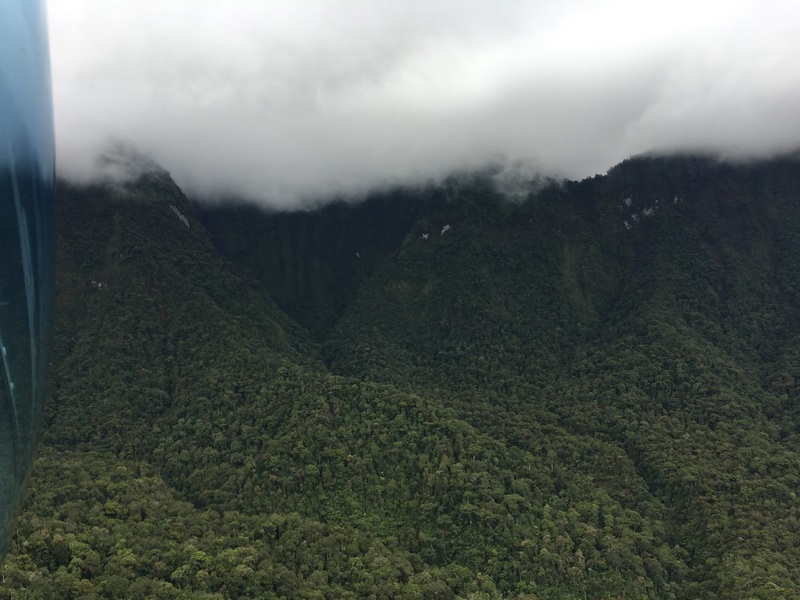 Mount Bosavi rises from almost sea level up to 8100 feet and spans about 40 miles! At the summit are jagged peaks that surround a deep crater with a diameter of 2.5 miles. 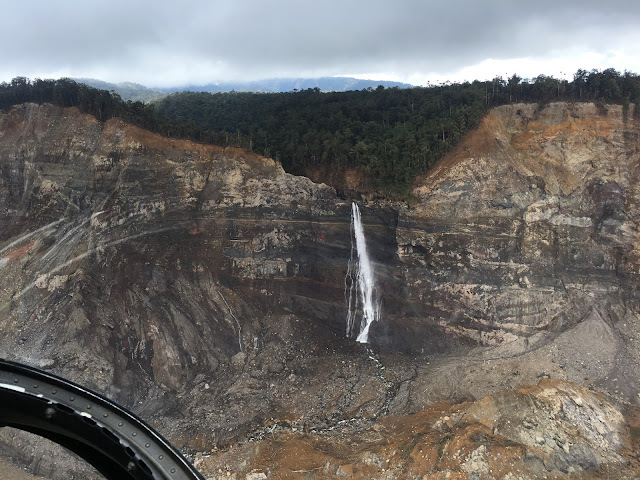 This crater is open on the south side and, though clouds surrounded the peaks of the volcano, the opening provided a perfect entrance into the crater. We flew in, circling around the massive space, gazing in awe at the sheer sides curving around and above us. Everything, like most of PNG, was covered with vegetation. Water flowed from the mountain sides, gathered together, and flowed out the massive opening, continuing its serpentine journey toward the southern coast. Inside the crater, looking out through the "entrance". Not the best picture, but gives some perspective. As we circled, I looked down and, to my surprise, there appeared to be a possible landing site. 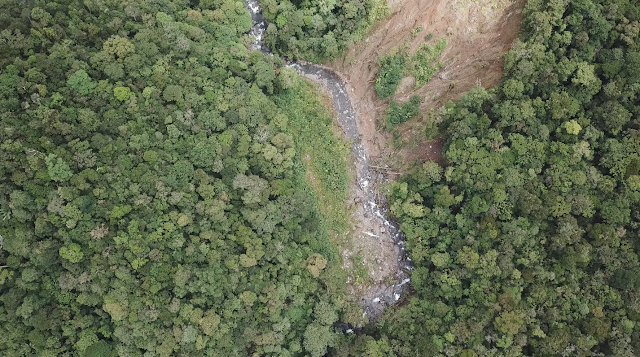 An area where a landslide years ago cleared away jungle near a stream allowed plenty of space for the helicopter to descend and land. We circled and landed, spending some time viewing the beauty of the area. 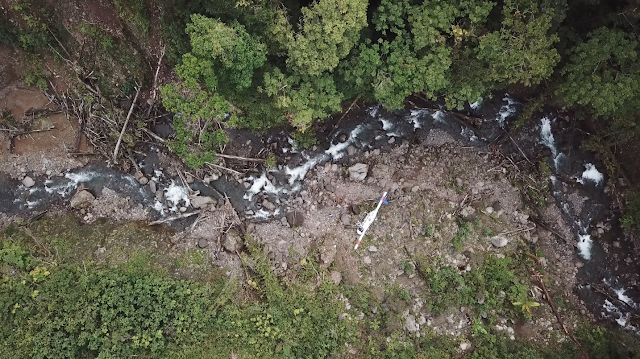 We even flew a drone around inside the crater, capturing incredible footage. Can you see the helicopter? On the ground inside of Mt. Bosavi. Of course, there was no lava flowing, steam, sulfur or anything else. It is an extinct volcano, that's it. Hopefully the footage we took and the people who rode along will be able to quell the rumors going around. While there is no evidence whatever that Bosavi is "waking", only God knows what's going on miles under the earth. When speaking to the people in various villages, we encouraged them that they don't need to fear the volcano right now, and that earthquakes are a common occurrence in many areas of the world. At the same time, we never know what each day is going to hold. God did not ask us to live in fear of the what-ifs, but to live from day to day fully trusting Him and His sovereignty. Despite what disasters happen, He is fully in control and is going to bring good from everything that happens on this earth. Humanity and all of creation is groaning from the burden of sin (Romans 8:18-25), but amidst the suffering and pain, we see evidence of God's love and goodness through His people. This was seen in the people gathering hundreds of pounds of food from their gardens to give to people they don't know in a completely different language group. This has been seen as people and organizations from all over seek to help those in need. It is felt through prayers of people who are on the other side of the world. It is known by the presence of the Holy Spirit in those who love Him and name Christ as the king of their lives. In exactly two months from today we leave for the USA, fours years to the day from when we arrived in PNG with our five toddlers and 10-year-old big boy. Last night my friend Sarah reminded me how glad I was to be done with that trans-Pacific flight, and wanting never to do it again with quints. She had wisely pointed out that they would be five-years-old the next time we went on a massive flight with them, and how much they would love the TV and video games in the seat backs; how very different it would be! Well, here we are. Time has FLOWN by in some ways, crawled in others. The days crawl, but the years fly, my mom used to say. And God's faithfulness and goodness permeate it all. Last night I had my first "going back to the USA for a year" stress dream. It was a very vivid dream and mostly fun and happy, but had all these elements of "How do I do this? Can my kids handle this?" - We were staying with strangers, and I was really worried about invading their space and inconveniencing them. They were amazing, though - super kind, generous and helpful. 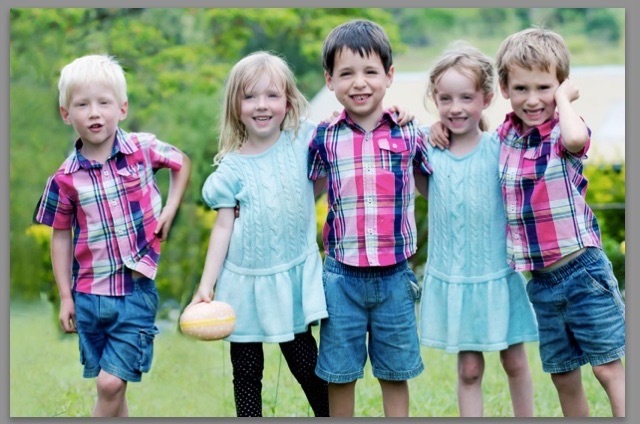 So you can see that I've had good experiences as a missionary kid, and look forward to my own kids having those experiences. - I couldn't find all the things I needed because it was a new place/house. - I was struggling to get the kids to school on time. - The people we stayed with were so kind, helpful and welcoming. - The kids were having a blast! Not excited to get up early and go to school in the cold dark, but otherwise happy about life in the U.S.A.
- The FOOD - that I did not make - was abundant and delicious!! 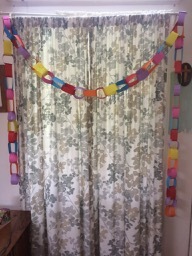 We have a paper chain hanging in our entryway window. Each kid chose a color, and each day it's someone's turn to rip off the link of the day. Every yellow one marks a week. David just tore off the yellow link marking eight weeks. Wow!